A fire that sparked near Seaman Reservoir in Larimer County grew to between 100 and 200 acres overnight. LAPORTE Colo. — A fire that sparked near Seaman Reservoir in Larimer County grew to 150 acres overnight. The Arapaho and Roosevelt National Forests and Pawnee National Grassland (ARP) Forest Service said the fire started Tuesday afternoon near the reservoir. The smoke was visible from Fort Collins. About an hour after it was located, the fire had grown to three to five acres. On Tuesday evening, the Forest Service reported that increasing winds caused the fire to swell up to more than 30 acres. That shrunk down to about 22 acres overnight, before growing to 150 acres by Wednesday evening, according to the Larimer Office of Emergency Management. The fire is about 25 percent contained, officials said. The National Weather Service out of Boulder will issue a Red Flag Warning starting at 11 a.m. and ending at 8 p.m. Wednesday and Thursday across northcentral and northwest Colorado because the weather could cause wildfires to rapidly spread. Reid Armstrong, spokesperson for the Seaman Fire, said Smith Bridge is half a mile away and there are cabins in that location that are threatened by the fire. They are owned by residents, but he said he does not know if the people are in the homes. Poudre Park, another residential area, is a mile and a half away. 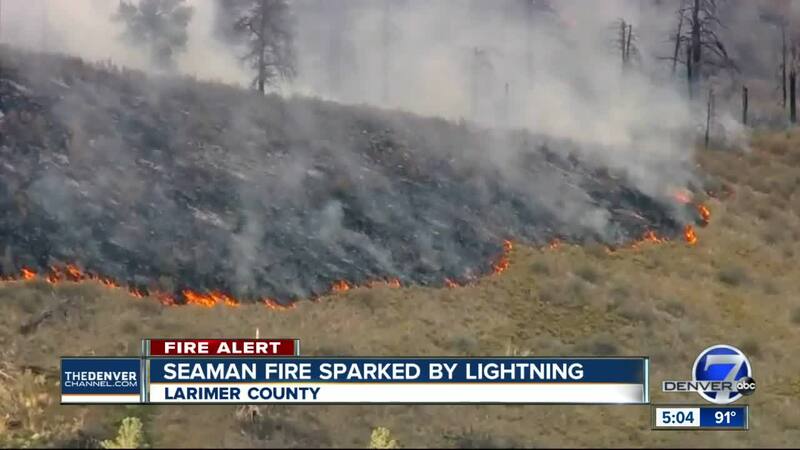 Lightning is likely the cause of the fire, according to the Forest Service. Kristen Peterson, a Poudre Canyon resident, said she was at work when she got the voluntary evacuation notice. "That was just an immediate, 'OK, turn around, this is serious enough that I had to be home and see what was going on,'" she said. Charlie Wrobbel, another resident, said last time the area had a big fire, he had to stay away for almost a month. But he said he is optimistic that firefighters will have control over the fire soon. So far, there have been no evacuations. Larimer OEM officials said there have been no damages to structures reported as of Wednesday night. Officials said another update on the fire would come Thursday morning.